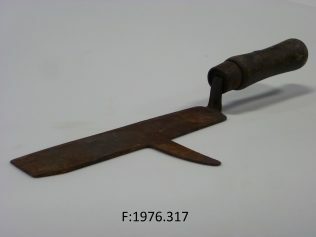 This right handed slater’s knife or axe, also known as a Zax, was used to make rectangular or square cuts on a thin piece of slate when dressing it for roofing. The blade is offset from the handle to protect the worker’s hand from flying slate fragments. Large pieces of slate could be split with the spike on the back of the Zax by first making holes along the cut line. This Zax is from Dublin City and measures 36.5cm long and 12cm at its widest.